Do You Want the Fitbit Ionic? Read This First! If you are like me, you love fitness trackers! I really can’t imagine exercising without one, they help me monitor my heart rate so I can get the most out of every workout! Just like phones, technology is always changing and it’s so tempting to upgrade your fitness watch every time a new one comes out. Fitbit’s new Ionic is a pretty sizable jump from any of their previous watches, but is it worth the cost of upgrading and how does it stack up to some of it’s competitors like the Apple Watch and Garmin’s Vivoactive 3? Here is a rundown of my opinion on the Fitbit Ionic! 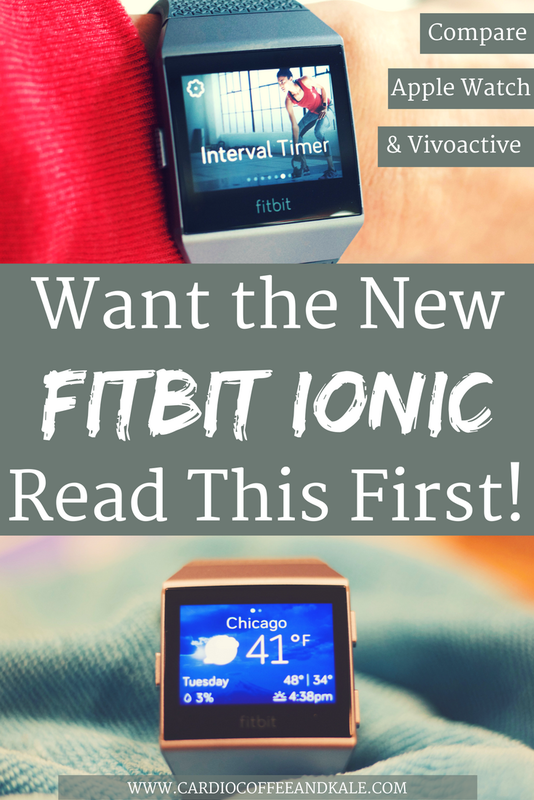 The Ionic is Fitbit’s attempt to offer an experience similar to the Apple Watch. Previously, Fitbit offered two more advanced fitness trackers; the Blaze, which had a great color touchscreen but lacked GPS tracking, and the Surge which offered GPS tracking, but lacked the color watch face and some ease of use. The Ionic is the best of those two trackers rolled into one! The new high resolution touch screen is an upgrade from the Blaze, and the look is much sleeker than the bulky Surge. Overall. I have to say I really like it! It's a big step up from my old Surge. I really believe that the band was one of the weakest parts of Fitbit’s product development prior to the Ionic. Literally every single person I knew that had a Surge fitness tracker had a broken band at least once…including myself. Every single person! If you have also had problems, you’ll be pleased to know that Fitbit did a great job in correcting the previous band issues. They addressed the inability to change the bands by making them interchangeable, in fact, the watch comes with a set of both small and large bands. Switching bands is simple and Fitbit has a large selection of swappable bands available to purchase separately on their website. They also used a sturdier feeling plastic, which appears to be much more durable. The new Ionic has pretty impressive graphics on the sleeker touchscreen. The high resolution screen features 348 by 250 pixel LCD screen in an attempt to compete with the Apple Watch. The face is made of gorilla glass and has amplified brightness, which make the graphics bright and clear! I am impressed with touchscreen overall, and as a bonus, it's water resistant to 50 meters. The clock face has 17 different options, and to maximize battery life, the display turns off automatically after several seconds. If you bring your arm up to look at the watch, the screen automatically turns back on. In comparison, the Vivoactive 3 screen stays on, but it doesn't appear to effect it's battery life, and it has a more traditional round watch face that also features a customizable watch face creator. Well, this is the sole purpose for me choosing this watch over the the Apple. I like the amount of feedback Fitbit gives for a workout and it’s so easy to navigate, especially since I was a previous Fitbit owner. There are several options for exercise tracking, but one new feature I like is the Interval Workout (here is the perfect workout to use with the preloaded Interval Timer). You can program the timer to whatever your desired intervals, and it alerts you when you are to do an exercise, and when to take a break. It’s a great way to do a quick hit of cardio to get warmed up, before a strength workout. Another good feature, is that if you forget to turn the fitness tracking mode on, it will automatically track your exercise using "Smarttrack." One new feature I was excited about was the VO2 max estimate, or Cardio Fitness Level, available with the new Ionic on the Fitbit app. To be completely honest, I think this may become available for anyone owning a Fitbit with a heart rate monitor in a new update, but when I checked my husband's app, it was not available yet. As of right now though, my new Fitbit app does have the Cardio Fitness Level and it is just another way to monitor your overall fitness and set goals to improve it. While the heart rate monitor seems to be slightly more accurate then my Surge, it still did lose tracking several times during my workouts. I wanted to test it doing a variety of workouts; cardio, strength, running, and yoga. Several times during the workouts the heart rate would go gray indicating that it had lost tracking, but it did pick the heart rate back up more quickly than my Surge did. Wearing the tracker as Fitbit recommends, three fingers above the wrist bone, and keeping it tight enough that it doesn’t move around, does help with heart rate monitoring. I confess that I do check my heart rate constantly to see how effective a workout is for calorie burn, but even when wearing it at the recommended location, it lost my heart rate on average 5-8 times per workout. Perhaps it has something to do with my physiology, but even after contacting Fitbit and resetting the watch, it still lost my heart rate for short periods during my workout. Overall, I do think that it is more accurate than my previous Fitbit’s monitoring. The Apple Watch seems to miss the mark as far as the fitness tracking when compared to the Ionic. I have several clients and friends that have Apple Watches and they struggle with navigating through the fitness information. In fact, most rarely use it for fitness tracking at all. Both the Ionic and the Vivoactive 3 have similar fitness tracking abilities, and seem to be pretty much on par with everything from heart rate monitoring, to both offering the VO2 Max estimate. Fitbit says the Ionic has a 5 day battery life, without using GPS, which shortens the battery life to about 10 hours. Mine did last a full five days before it needed charging the first time I wore it, and it takes one to two hours to be fully charged. The Vivoactive boasts a full week between charges, but the Apple Watch only has an 18 hour life and requires an overnight charging. The Ionic has a collection of several apps that you can chose from, and while the selection is not huge, it does include things like Starbucks, weather, music, timers, and some other fitness apps like Strava (running app) and Relax (stress monitoring), and a fitness coaching app. The wallet allows you to pay at stores without needing to carry a wallet or your phone, as does the Starbucks app which connects the watch to your Starbucks account, allowing you to easily use your watch to pay for your coffee! That's a winner for me! The Ionic stores your music directly, allowing you to listen wirelessly, eliminating the need to carry your phone. You have a choice of using Pandora, or manually selecting playlists from your computer and syncing it to your watch. This was the only real hiccup in my Ionic experience. While contacting them about the Ionic losing my heart rate, and troubleshooting through the process, I had mentioned that I was writing a review on my blog about the Ionic...at which point the customer service representative dropped all correspondence. He never returned to the conversation and Fitbit never sent an email asking about my experience or anything. To be honest, it was kind of weird! I have to say I really like my Ionic! I love the higher resolution color screen, sleeker look and the exchangeable bands. The wireless music and wallet make it almost as good as a smart watch, and I think the fitness tracking is more than adequate for most users. Deciding between the Apple Watch and the Ionic really depends on if you want a smart watch or a fitness tracker? If you are seeking a fitness tracker, than the Ionic or the Vivoactive 3 are probably the best choice, and it really comes down to which company you feel more familiar with. If you've previously owned Fitbit, then the Ionic will be easy to navigate, likewise if you were a previous Garmin owner, than the Vivoactive 3 is probably your best bet. I am very happy with my Fitbit and would definitely buy it again. It's a big jump from my Surge and it does everything I need it to do and more. I would definitely recommend it to a client or friend! Please comment below and let me know what fitness trackers you love! To take a look at the Ionic color choices: Charcoal/Smoke Gray, Blue-Gray/Silver and Slate Blue/Burnt Orange. Could your workout be making you gain weight? Find out here! If you'd like to follow our newsletter, fill out the form below.